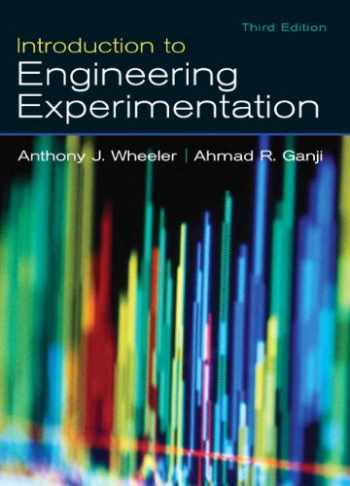 Acknowledged author Anthony J. Wheeler wrote Introduction to Engineering Experimentation (3rd Edition) comprising 480 pages back in 2009. Textbook and etextbook are published under ISBN 0131742760 and 9780131742765. Since then Introduction to Engineering Experimentation (3rd Edition) textbook received total rating of 4 stars and was available to sell back to BooksRun online for the top buyback price of $88.56 or rent at the marketplace. KEY BENEFIT: An up-to-date, practical introduction to engineering experimentation. Introduction to Engineering Experimentation, 3E introduces many topics that engineers need to master in order to plan, design, and document a successful experiment or measurement system. The text offers a practical approach with current examples and thorough discussions of key topics, including those often ignored or merely touched upon by other texts, such as modern computerized data acquisition systems, electrical output measuring devices, and in-depth coverage of experimental uncertainty analysis. The book includes theoretical coverage and selected applications of statistics and probability, instrument dynamic response, uncertainty analysis and Fourier analysis; detailed descriptions of computerized data acquisition systems and system components, as well as a wide range of common sensors and measurement systems such as strain gages and thermocouples. Worked examples are provided for theoretical topics and sources of uncertainty are presented for measurement systems. For engineering professionals looking for an up-to-date, practical introduction to the field of engineering experimentation.